Mustang Run features a large plush recreation room, wide concrete roads, and long concrete pads. All sites are 50 amp full hookups. Other amenities include a swimming pool, clean modern restrooms and showers, and dog run. Very clean, level concrete sites. Office clean but messed up our reservation. Park is right on the freeway frontage. Very noisy hearing trucks hit the rumble strip. Not new. We stayed here overnight in a 40’ fifth wheel in March 2018. It is a very clean park, the sites are concrete and level. It is convenient to I 40 and has storm shelters. The laundry, bathroom, and showers are very nicely done. The dog park is adequate but not huge. There is a pool but it was closed. The park is clean and well-maintained. The check-in Lodge is quite impressive. Exiting the park could be hazardous if you try to turn left. Go right and go to the next exit for safety! Be prepared for significant road noise from the interstate. We stayed 1 night on our way to Ca & wished we could have stayed longer. Beautiful facilities and friendly staff. The facilities here are as good as they get with a minor quirk or two. Water pressure in womens shower was nearly non existent except the handicap shower, Location can be a huge problem for some. 1) it is difficult to find 2) it sits right next to I-40 and traffic noise is loud. I only spoke to one of staff the next morning and she was very pleasant. 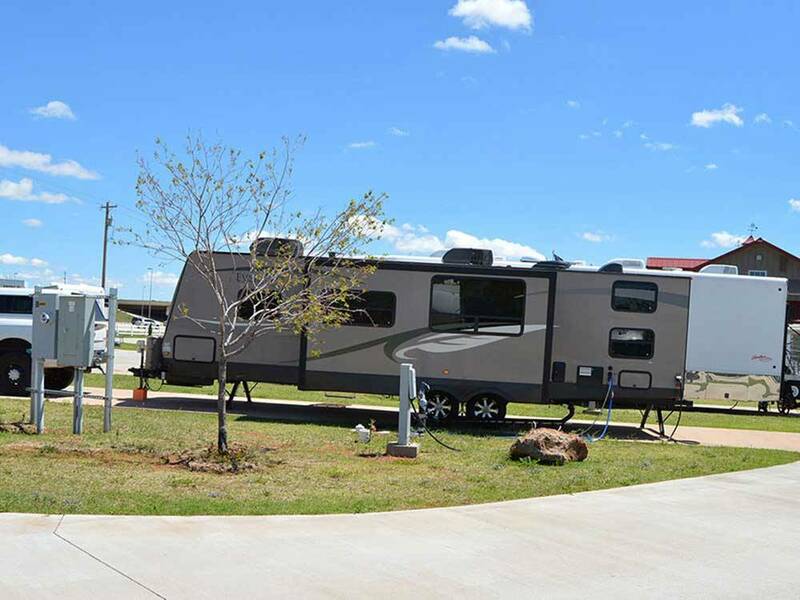 Overall, it is a very nice rv park unless the noise level is a problem. Best location in the OKC area. We have stayed here at least 8 times, and have not had any bad experiences. Easy off on for I40. Owners are very nice and attentive to any needs. Club house has free coffee in the morning. A grill is available for use poolside. Bathrooms are immaculate. Sites cement and level. Great park but we only stayed one night. Beautiful office and lounge area and the staff was very polite and helpful. The bathroom and showers are top notch and clean! The only negative is that the park sits so close to the highway that the road noise is very loud and distracting. Would definitely stay again if in the area. We enjoyed out brief visit. We did have a issue with electrical hookup but the staff was very quick and attentive to help. We would stay here again. The facilities were very modern and clean. The pool was closed but looked well kept We walked to a restaurant which was nice so we didn't have to unhook the truck. Right off the freeway, we stayed there as a stop over point and it worked great. Front desk staff was helpful, explained all park amenities. We appreciated the poolside grill which we used. park appears new, bathrooms were very clean and well maintained. Park also included storm shelter access for the occasional tornado which was thoughtful. The pool was small compared to other parks we've been but it did the trick for the kids after a long day on the road. Park is also near most shopping needs if that factors. Except for a little difficulty finding the park entrance, our stay was awesome. It's only 1 1/2 years old and it still sparkles. Some folks cratched a bit on the I-40 traffic noise but, our A/C is so loud that we didn't notice. We'll definitely be back! Very clean, paved level spots for easy set up. Laundry, restrooms well kept. This campground definitely ranks in our top 5! This was my first experience at any RV park. This park was very clean. The newness of the park is very evident. The concrete drive and parking areas were wide, level, and smooth. I did not have time to use any of the facilities so can not comment on them. I had a decent stay at this park and would return if I were in the area. One minor concern is the noise coming from the trucks on the interstate. Overall a good first RV park experience.